It was the last great science hero fight, but the energy blast ripped a hole in reality, and birthed the Empire State - a young, twisted parallel prohibition-era New York. The first book is called Empire State, and it’s sort of a science fiction-detective-noir. Private detective Rad Bradbury, who lives in this dreary, fog-bound city called the Empire State, is called to investigate a gruesome murder, only to find himself being chased not only by a superhero who is supposed to be dead, but by a couple of masked agents who seem to know an awful lot about him. 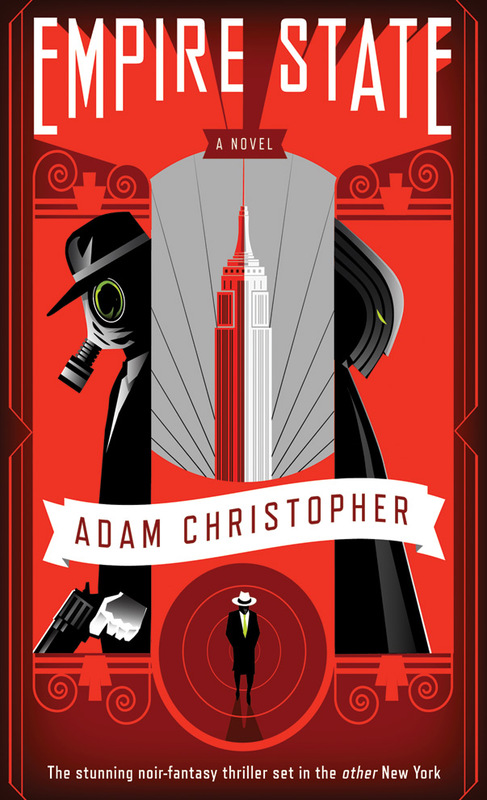 His investigations reveal an alarming secret about the Empire State and its connection with another place called New York, and he gets caught up in a conspiracy that threatens both worlds. Empire State will hit the shelves at the end of December in the States and the first week of January in the UK. Christopher looks to be an author to watch if you're a fan of Superheros as he has a standalone sequel titled Seven Wonders that will be out in the latter half of 2012. DAMN, that is am awesome sight! What a great cover and seems to hit spot on everything I expect about the book. I'm looking forward to both books since @ghostfinder got signed, I'm a huge superhero fan! Great job @angryrobotbooks! Looks interesting. I wonder how it'll compare to the George Mann books about The Ghost. Beautiful artwork on that cover, I wouldn't mind one large-scale to hang on the wall as a poster. Hey, there's an idea? You just might get your wish on the poster art. The piece was done by Will Staehle who does turn his art into posters from time-to-time. I'm hoping for better than Mann's Ghost books as I felt those were a bit hollow. I've only read Ghosts of Manhattan, and I won't dispute the hollow claim. I still found them to be fairly fun. But certainly, looking for something better. Planning on reading the sequel sometime soon.